It's incredible. 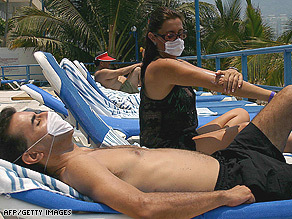 People are still out in public in areas that have widespread infection of swine flu. CNN now reports that we're up to 331 confirmed cases. I suspect these numbers will grow exponentially as swine flu spreads like the common cold. I think many people aren't taking this very seriously and they don't realize the public health implications behind this spreading infection. It's scary to think what the numbers will look like next week. Or maybe the news is taking it too seriously. Did you know nearly 35,000 people die every year from 'normal' flu? You don't hear about that much, do you? This is a scare to sell more medicine. 1) I think the media needs to get serious about not scaring people. There are many more serious diseases in the world that are just as contagious and kill a LOT more people, it's called HUNGER. Ever heard of that disease? How is it contagious? Ask those hungry people.
" I think many people aren't taking this very seriously and they don't realize the public health implications behind this spreading infection"
We're all gonna die!!!! Let's see 311 have gotten it out of 6.5+ billion people on the planet. It has a mere 6% fatality rate. I should start the panic right now because my odds of catching it and dying from it are less than being struck by lightning or winning the Megamillions $220 million jackpot. Um, when has the world health orgainization raised the alarm like this? SARS? Having lived through AIDS, and seeing about 20 people I knew personally die of it. I am gonna hold my skepticism that this is all media hype. What this looks like next week will be the first test. Please, people need to simmer down. I mean seriously, more people will die of drowning in their own bath tubs than from this flu. There are thousands of viruses running all around us every day that could potentially kill us. Are you all going to live in a bubble for the rest of your life? The numbers next week? Hmmm...maybe 1 or 2 thousand may have it? So what? Should we all live indoors and hoard food? I have an idea...let's all live in fear. You've been watching too many disaster movies. The pandemic disease scenario is the topic of many a movie. Maybe because it preys on people's fears? Sort of the like how the media is preying on our fears? IF APPROXIMATELY 36,000 DIE EVERY YEAR FROM FLU AS PER THE CDC (See website link below), WHY IS THIS FLU SITUATION SO DIFFERENT? IT SEEMS THAT WE SHOULD BE CONCERNED, WEAR MASKS, LIMIT TRAVEL, CANCEL SCHOOL AND OTHER SPORTS AND SOCIAL EVENTS EVERY YEAR DURING FLU SEASON, AS WE COULD JUST AS EASILY BE ONE OF THOSE 36,000...BUT THIS TIME IT IS DIFFERENT BECAUSE 331 PERSONS HAVE ACTIVE CASES AND HOW MANY HAVE DIED THUS FAR? HOW MANY PIGS ARE SICK? IS THERE SOME OTHER REASON FOR ALL THE PANIC THAT WE SHOULD BE ASKING HERE BEFORE WE SLAUGHTER ALL THE PIGS AROUND THE WORLD? WHY IS THERE A CONCERTED EFFORT TO CREATE MORE CONCERN AND PANIC THAN WE WOULD NORMALLY HAVE FOR ANY OTHER FLU SEASON BY GOVERNMENT, STATE, COUNTY AND CITY OFFICIALS? CDC estimated that about 36,000 people died of flu-related causes each year, on average, during the 1990s in the United States. The number of influenza-associated (i.e., flu-related) deaths varies from year to year because flu seasons often fluctuate in length and severity. This figure includes people dying from complications of flu. This estimate came from a 2003 study published in the Journal of the American Medication Association (JAMA), which looked at the 1990-91 through the 1998-99 flu seasons . During these years, the number of estimated deaths ranged from 17,000to 52,000. In 2009, CDC published additional estimates of flu-related deaths comparing different methods, including the methods used in the 2003 JAMA study. Results from this study showed that during this time period, 36,171 flu-related deaths occurred per year, on average. This statistic came from a 2003 JAMA study by CDC scientists . The study used statistical modeling to estimate that during 9 influenza seasons from 1990-91 through 1998-99, an annual average of 36,000 flu-related deaths occurred among people whose underlying cause of death on their death certificate was listed as a respiratory or circulatory disease. Flu-related deaths are deaths that occur in people for whom influenza infection was likely a contributor to the cause of death, but not necessarily the primary cause of death. I, too, am wondering very much why there is so much sustained media hype about the "swine flu". The obvious comparisons to the seasonal strains of flu people get every year aside, if this strain were of pandemic potential, would we not already see much higher infection rates? Patient zero was first sick about a month ago. The "pandemic" has been with us for about a week. An exponential infection rate would already be showing many more people infected. I do not in any way mean to belittle the loss incurred by anyone as a result of this flu. For them, of course, this IS a tragedy. If swine flu turns into a true pandemic, then we will see potentially millions of lives lost (if not more). The scary thing about swine flu is that it's killing young, healthy people. Influenza (normal human flu) can cause death, but this usually occurs in older adults, young children, or in those who have chronic lung conditions. I think this is a test to see the publics reaction to a widely publicised 'pandemic'...because in the future when a real pandemic strikes, the ones who lets the flu bug loose will want to know what they have to deal with. Poor Baxter, what with the 'accidentally' released avian flu, this viral attempt was surely a flop as well. But not to fear oh public, next time they'll get it right....and be waiting with their timely stores of Tamiflu...as we are all given restrictions and put on long term quarantine in our homes. They'll find a way to get us to surrender the last of the freedoms we are deluded to think we have....all in the name of public safety. I agree, Dr. Kim, that there are many people who aren't taking the swine flu seriously. On the other hand, I also believe that the media is blowing the risk out of proportion. Is the swine flu spreading quickly? Yes. But such a small number of people are suffering from it compared with the population of the entire planet. Seasonal influenza spreads just as rapidly. I have long been immune compromised (very low levels of IgA, IgM, IgG) so I always use antibacterial hand sanitizer, take Airborne before I go to the pharmacy or grocery store and use the pharmacy's drive-through whenever possible to avoid being in a confined area with others. However, there is only so much one can do. If someone has run out of food, are you suggesting, Dr. Kim, that they just avoid going to the market for groceries for the next several weeks? You and members of the media advise that we are not taking this seriously enough as though everyone has a choice in the matter. Although I am now on disability, when I was working, I had quite a few bosses who threatened to fire people for not going into work even when they were sick. Going to HR about these "bullies", who never seemed to get sick themselves, just made these bosses treat the "problem employee" more harshly. With the economy the way it is today, I highly doubt that people will risk their jobs in order to avoid getting the swine flu. Perhaps you and other health care providers could suggest that lawmakers take steps to ensure that employers who do not comply with CDC recommendations be penalized. Will this be a nation wide "Katrina Type Responce" for this administration if not taken seriously. Maybe if there was more than one death and that person wasn't ALREADY SICK and from MEXICO, we would take it more seriously. The prez is spending ANOTHER 1.5 billion for this ONE kid. What does the CDC do with their current budget? Send it to Mexico? You guys have it all wrong. You're looking at the 36,000 deaths OUT OF CONTEXT. What do I mean? CDC: 5% to 20% of Americans are infected annually with the flu, which results in 36,000 deaths. Now compare that to the 36,000 deaths from the regular flu.